Remember comedian Hasan Minhaj’s speech at the 2017 White House Correspondents’ Dinner? He said that minorities “got to work twice as hard for half the credit.” But what happens when all that extra expended energy physically catches up to people of color? Poet Claudia Rankine describes this experience of John Henryism, applicable to many black athletes, in Citizen: An American Lyric. Rankine not only features David Hammons’s 1993 artwork, In the Hood, on the cover of Citizen, but wrote a poem for the artist as well. As a result, it is not surprising that Rankine’s poetry works so effortlessly as an explanation for Hammons’s Champ, created fifteen years before Citizen. Champ’s bright red boxing gloves could be a nod to Muhammad Ali, like Keith Haring’s tribute to friend and fellow artist Jean-Michel Basquiat with A Pile of Crowns for Jean-Michel Basquiat. Regardless, Hammons makes a statement about the black experience and the aspiration of becoming a professional athlete. Duct-taped and tied together, the boxing gloves are the only icons of victory preventing the dark, rubber inner tube from becoming a victim’s flayed skin. Their unity alludes to the belief that black people cannot exist as significant and successful individuals unless they obtain athletic greatness. In a way, Champ is the contemporary Farnese Hercules—both the heroic Hercules and the remnants of the defeated lion. While the red boxing gloves serve as a symbol of muscular strength through sport and athleticism, akin to Hercules, the flaccid rubber inner tube is reminiscent of the flayed lion skin Hercules wears. The attachment of the boxing gloves to the inner tube rather than a human body emphasizes that this determination for greatness attributed to the champion’s own undoing—he is simultaneously the victor and the victim. Hanging from a nail on the wall, Champ commemorates and mourns the black athletes, especially boxers, who “achieve themselves to death” and become symbols of black excellence. Krasinski, Jennifer. “Looking for Art in the Elsewhere: Fifty Years of David Hammons on View at Mnuchin Gallery.” The Village Voice, 2016. Markus, David. “David Hammons.” Art in America, 2016. Weiner, Andrew Stefan. 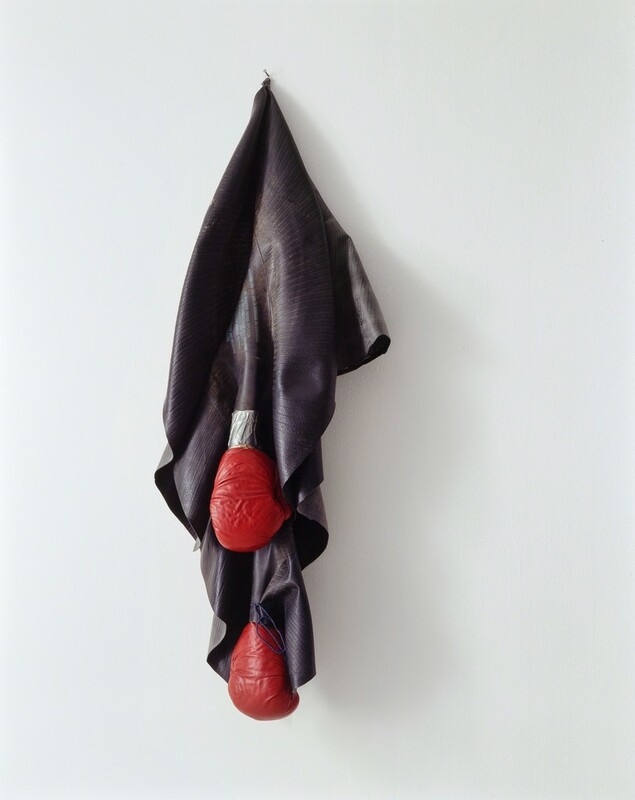 “David Hammons: Five Decades.” Art Agenda, 2016.